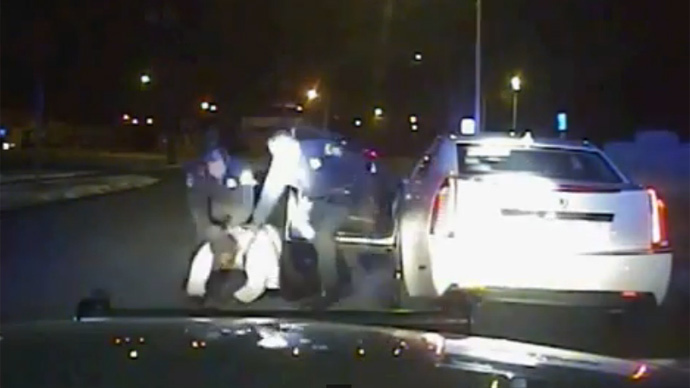 Newly released police dashcam footage shows the violent arrest of an unarmed African-American during an alleged traffic violation in Michigan. The man claims he did nothing wrong but was put in a chokehold, beaten and Tasered repeatedly. The incident, which is now under state investigation, happened in January, but the police dashcam video was obtained by Detroit’s WDIV and released on Tuesday. The video shows Michigan State Police pulling over Floyd Dent, 57, for an alleged traffic violation. Dent is seen opening his car door as two police officers arrive, one with his gun drawn, and pull him from the car, forcing him to the ground. One officer put him in a chokehold. According to police reports, officers were watching an area in Inkster, a suburb of Detroit known to have drug activity, when they saw Dent’s car through binoculars. They followed him and said Dent didn’t make a complete stop at a stop sign. When police turned on their flashing lights, Dent didn’t immediately respond, though he did eventually pull over. While in a chokehold, Dent was punched 16 times in the head by one officer. Another one tried to handcuff him, and a third officer arrived and Tasered him three times. Police officers claim they were protecting themselves, that Dent resisted arrest and bit the officer who placed him in a chokehold in the arm, but there is no evidence of the police officer seeking medical treatment, according to WDIV. What the video shows in its final scenes is Dent with a bleeding head being held on the front of a police car. Police later accused Dent of having a suspended driving license and for possession of crack cocaine, which they claim they found in the car. Dent tested negative for drugs and claims they were planted. Dent is being prosecuted for drug possession. He was offered a plea deal, which he rejected, and goes to court on April 1. The police officer who held Dent in the chokehold, William Melendez, has been in trouble before, according to WDIV. He was fired from the Detroit Police Department for falsifying records. In 2003, he was also charged criminally in federal court for planting evidence, although a jury found him not guilty. He is now on desk duty. Around 50 demonstrators protested against the brutality outside the Inkster Police Department on Wednesday. Police Chief Vicki Yost told protestors the state police department is conducting an investigation into the case. "I understand your concern," Yost said, according to AP. "Again, we're going to let the investigation play out...we're going to act accordingly. We're not hiding from this."